At Doral Toyota, we try to be a valuable resource for drivers in the Doral, Miami, Kendall, and Hialeah areas who are actively searching for their next car. One of the ways we help drivers in our area is by providing research materials to help them make the right decision toward their next car. That’s why we have this vehicle review library. When you’re in the market for a new vehicle, regardless of model, you need to know exactly what you’re getting. A new vehicle is a major investment and a huge decision, so it behooves you to conduct research to make a wise choice for your future. Based on your preferences, you can tell which models are better fits for you and your family. You may even learn about some exciting new features. Now that you know about these features, you’ll find a vehicle that has the exact amenities you’re looking for. Finding the right vehicle is never easy. Our reviews are designed to provide detailed information that’s more relevant to you, the consumer. These articles focus on engine power and performance in each Toyota model without getting too technical. We’ll also show you the interior space, comforts, amenities, and safety features. 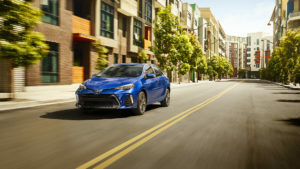 By learning about what your favorite Toyota vehicles offer, and what they can do, you’ll be able to decide whether the vehicle is right for you based on its abilities and features. Why Are These Pages Here? While our Toyota reviews can be helpful for drivers who are searching for their next car, you’re not required to read them. They’re simply here for drivers to use while researching a few models to help decide which one will be their next vehicle. However, if you’re currently in the market for a new car, these vehicle reviews could prove useful in showing you a great deal about cars you’re interested in. To get started, simply look below and find a Toyota or two that interests you. Learn all about what that vehicle offers, and what it can do while out on the road. You’ll be happy you did the research before making your final decision. At Doral Toyota, we’re proud to be a helpful resource for drivers in the Doral, Miami, Kendall, and Hialeah areas who are trying to find a vehicle that’s right for them.